At Hertzog Eye Care, we have a great selection of frames in a wide range of prices and styles (from designer to conservative) with any type of lenses available. Lens types include the latest progressive (no-line bifocal) designs, transitions (lenses that tint into sunglasses when outside in the sun), and any lens color and tint you would want in sunglasses. Also, we have a full-service optical with a lab, so we can make most glasses in-house. Kimmy, Kelly, and Terrie will make sure that you leave our optical shop looking like you just stepped off the plane from Paris. Also, if you have a current contact lens prescription (less than one year old) and need to buy more contacts, we can order any lenses available on the market. The refraction test, which determines the prescription that gives you the sharpest vision in new glasses, is not covered by most medical insurance plans. However, we've set very reasonable fees for both normal refractions and prism refractions. We perform a prism refraction if you have problems with double vision. 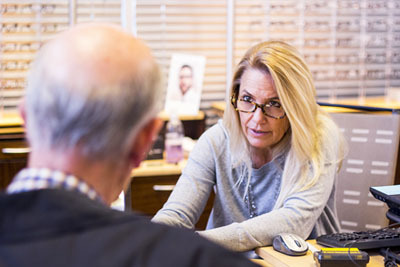 We've helped countless patients who have suffered from double vision see single again. We quote all of our patients the appropriate fee once we determine what type of refraction is necessary, and you can decide at that point if you would like to proceed. 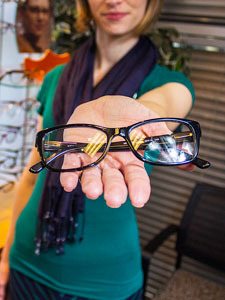 So don't suffer any longer from blurry or double vision - please give us a call. This is a patient who has never had a contact lens exam in our office, even if they are a current contact lens wearer (their contacts were prescribed by another doctor). The fee includes the refraction, contact lens training (if necessary), all trial lenses, and 2 follow-ups within 2 months of the initial evaluation. Follow-ups thereafter will be an additional fee/visit. This is a patient who has had a contact lens fitting at our office in the past. The fee includes the refraction, all trial lenses, and 2 follow-ups within 2 months of the initial evaluation. Follow-ups thereafter will be an additional fee/visit. Order Contacts Online! This evaluation is for a contact lens patient with a unique corneal condition/irregularity that requires more time for the fitting process. For example, this would include, but is not limited to, patients with keratoconus, previous corneal transplant, or previous radial keratotomy. Most patients with these conditions are dependent on therapeutic contact lenses to provide them with functional vision. The fitting fee includes the refraction, contact lens training (if necessary), all trial lenses, and 3 follow-ups within 3 months of the initial evaluation. Follow-ups thereafter will be an additional fee/visit. Please don't hesitate to contact us either through our website or by phone (562-597-3100) and we'll be happy to quote the appropriate fees for your specific needs.